The MIT Council for Educational Technology (MITCET) and the Office of Educational Innovation and Technology (OEIT) are pleased to announce the winners of the first round of the 2012 iCampus Student Prize competition. Each of the winning projects embody the spirit of the competition—they are developing real solutions to enhance life and learning at MIT. The 2012 competition is a two-stage competition. In the first round, student teams were asked to create working prototypes, and to define the needs assessment and impact of their projects. In the first round, the winners each receive $1,000. Five of the first round winners have been invited to compete in the final round where they are vying for a grand prize of up to $10,000 and are expected to deliver fully functional projects. 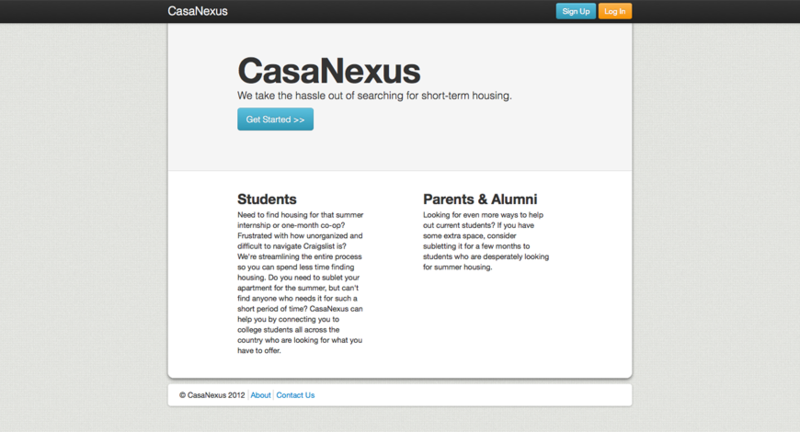 CasaNexus: CasaNexus will provide an easy to use interface for posting and searching for housing for the short-­‐term work opportunities many MIT students pursue to gain insights about fields or industries that they would be interested in working. Team: Connie Chan ’12 and Moji Jimoh ’12. CourseRoad: CourseRoad builds a user-friendly page where users can map out their classes through their undergraduate careers. CourseRoad presents the user with a vertical timeline of her undergraduate semesters, and makes it easy to add, remove, and drag classes between terms. The site then provides a web of prerequisite and corequisite connections behind the class modules and visually alerts the user to any conflicts. Team: Danny Ben-David ’15. Dormbase: Dormbase is an open-source dormitory database system that is flexible and expandable. The Dormbase project provides a dorm management system that can evolve overtime to suit the changing needs of the various dorms and their residents. Team: Kojo Acquah ’14, Alex Chernyakhosvky ’14, Cosmos Darwin ’15, Drew Dennison ’13, Chris Dolan ’13, Isaac Evans ’13, Dwyane George ’15, Chris Klingshirn ’15, Luke O’Malley ’14. STEMid: STEMid (STEM internship database) is a web platform that aggregates STEM (Science, Technology, Engineering and Mathematics) internship listings scattered across the internet. Team: Ignatius Chen ’13, Melissa Choi, Roodolph St. Pierre and Marc-Dannie. Tango: Tango is an academic network that connects students to classmates from the start during class registration. On Tango, you can pick your current classes or future classes you’re interested in and see potential classmates and teammates also considering similar classes. Team: Ray Li ’12, Jessica Lin ’12, Sarah Rumbley ’12. Nom Nom Now: Never go hungry again! 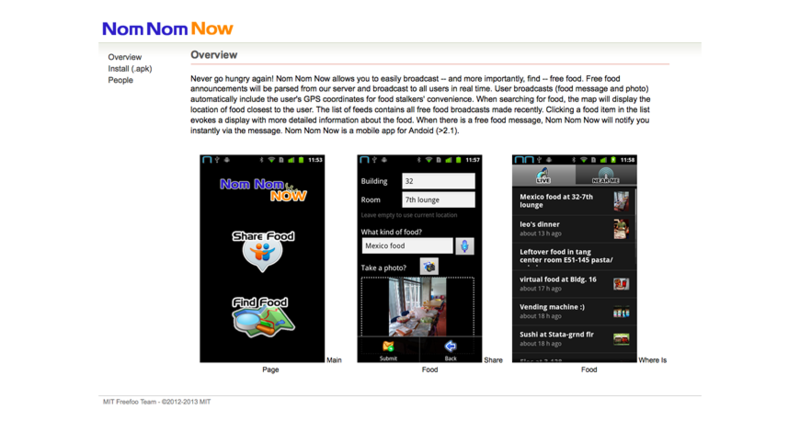 Nom Nom Now allows the user to easily broadcast — and more importantly, find — free food. Team: Chen-Hsiang (Jones) Yu ‘G, David Ogutu ’14, Adisa Kruayatidee ’15. Details on the winning projects, as well as video of the five-minute “pitches” given by the students can be found at the iCampus Prize website: http://icampusprize.mit.edu/. The judging panel included Hal Abelson the Class of 1922 Professor of Computer Science and Engineering, Jim Cain from OEIT, Edwin Guarin from Microsoft, Vijay Kumar from OEIT, Brandon Muramatsu from OEIT, Paul Oka from Microsoft Research, Pawan Sinha from Brain and Cognitive Sciences, and Oliver Thomas from Information Systems and Technology. Look for the announcements of final presentations in late-April/early-May 2012. The final round competition will include a poster session to allow guests and judges to speak with each group and learn more about the projects. The competition concludes with a lightning round of 5 minute presentations by each group. Judges for the competition will include representatives from Microsoft, MIT faculty and staff, and others.